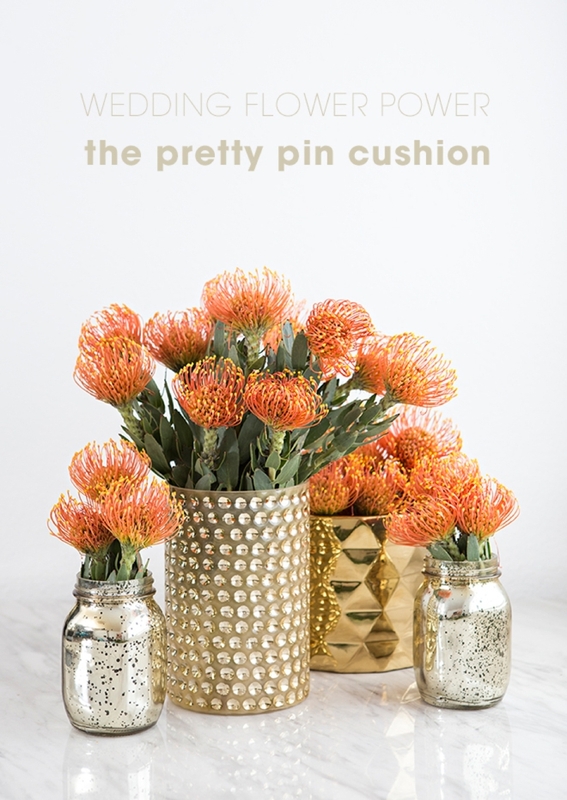 In today’s #flowerpower feature, we’re celebrating the pretty pin cushion. 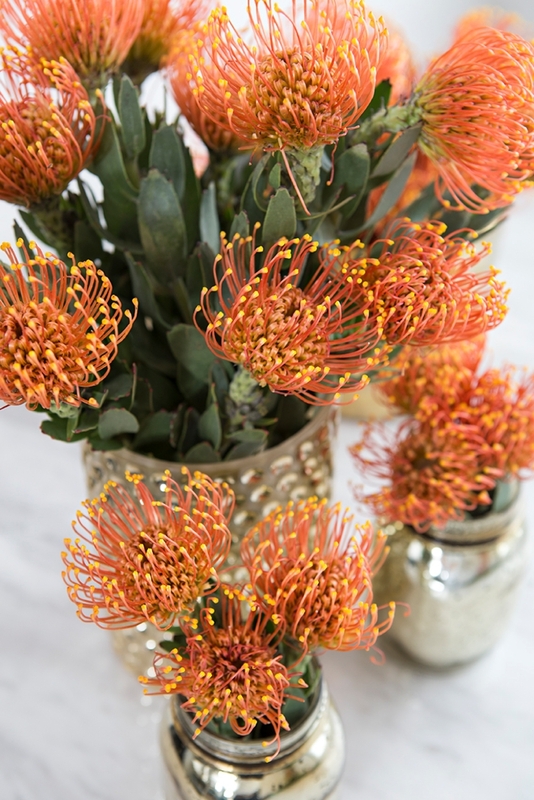 A member of the Protea family, these wild looking beauties get their name because they resemble pin cushions! 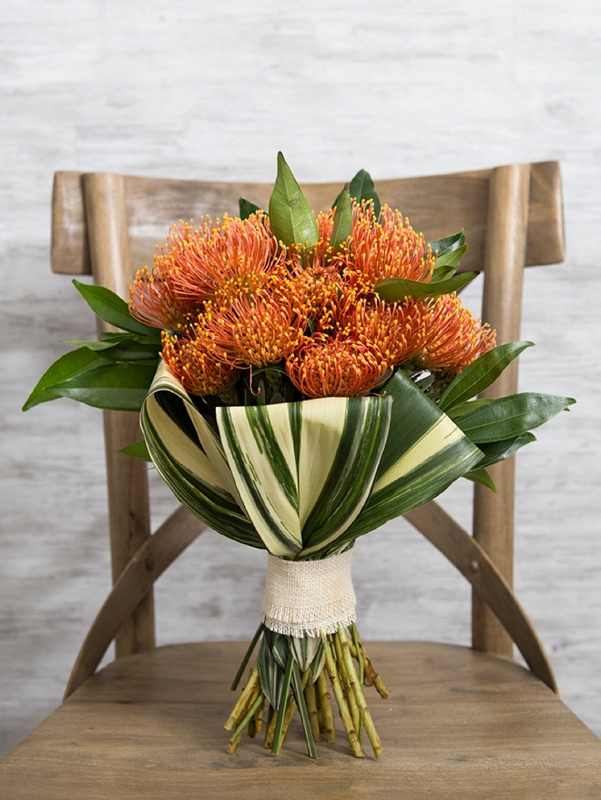 They are a long-lasting flower that features one bloom per stem and are available in Red, Orange (pictured here) and Yellow. They make a great statement piece or addition to a variety of looks including modern, tropical and bohemian. 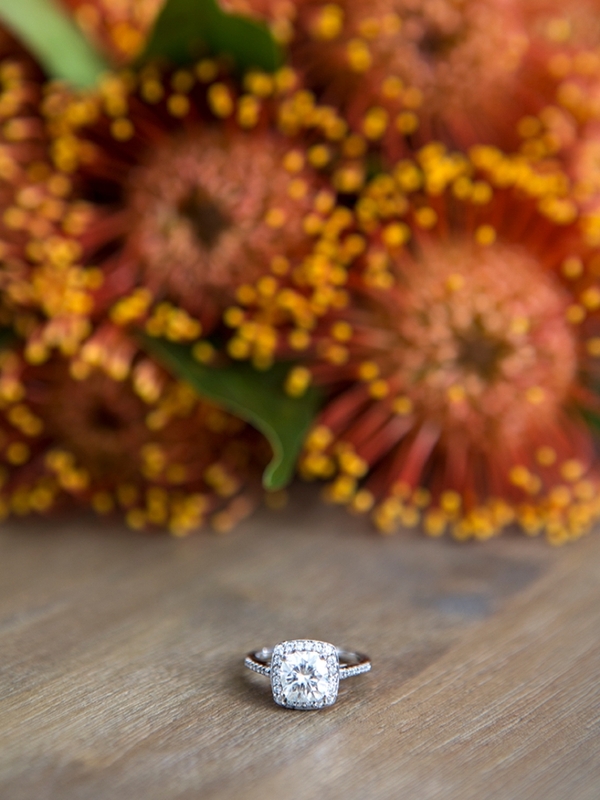 Pin Cushion flowers are said to represent diversity and courage… and are sure to steal the show! 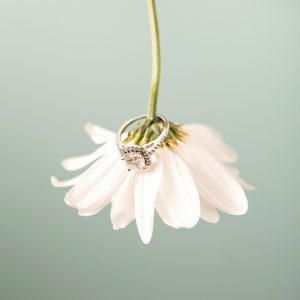 Each month we’re featuring a specific, popular wedding flower, sharing important tips and information that all DIY brides will find valuable if incorporating said blooms into their events. 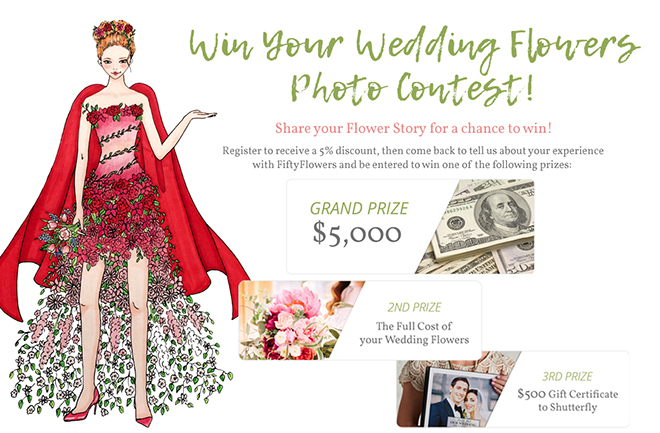 Whether you’re arranging your own bridal shower flowers or creating your own wedding bouquets, I hope you enjoy the tips and information below. Pin cushions in all three colors are available year round, yay! 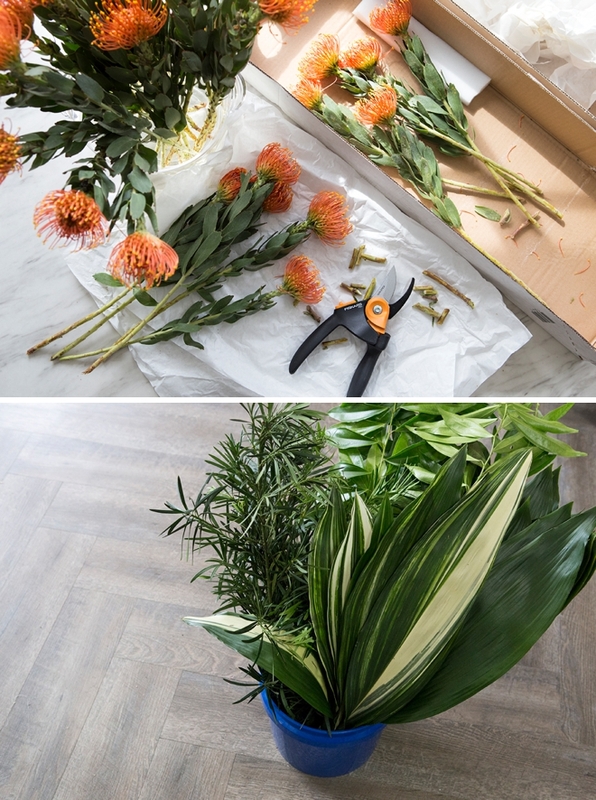 In this post, I’m featuring the Orange Pin Cushions and tropical leaves called podocarpus, aspidistra, cordyline (aka. ti leaves) and cocculus. These bulk pin cushions are shipped directly from FiftyFlowers.com partner farms. Before shipping your flowers, they prepare them for their journey with proper hydration methods. If your flowers appear sleepy and thirsty after their journey, it is absolutely NORMAL. Just follow these simple steps and the flowers will bloom delightfully! Open the box of flowers/greenery and inspect. 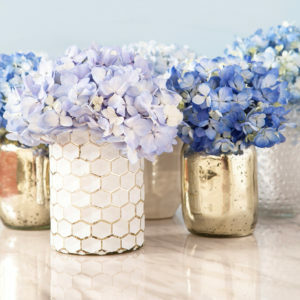 Ensure that your flower vases/containers/buckets are clean and disinfected. Fill vases/containers/buckets with at least 4″ of fresh, cool water. Cut the bottom of the stems diagonally approximately an inch from bottom under running water with sharp scissors or a knife. This will create a fresh surface to absorb water. Change the water every day to keep them as fresh as possible! Assure that your flowers have sufficient water. The flowers will drink an exceptionally large amount of water upon arrival. Hardware store buckets are terrific for rehydration! These darling pin cushions pair well with almost anything, they are fabulous alone and would be wonderful placed here and there. Individual stems make terrific boutonnieres because they fair well out of water. Their strong tropical look works great with all variety of roses, craspedia billy balls, lily grass, baby’s breath and tropical greenery. The bright red, orange and yellow shades can add a pop of color anywhere you need it. 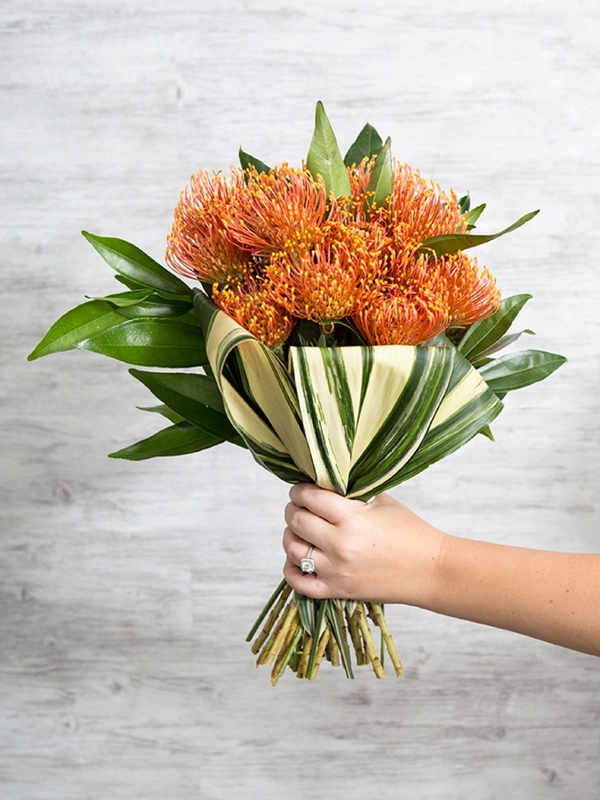 As a member of one of the oldest families of flowers on earth, protea flowers date back 300 million years and, according to Greek legend, are named after Proteus the son of Poseidon. Making these blooms ideal for your nautical, beach or ocean front wedding – especially during the fall! 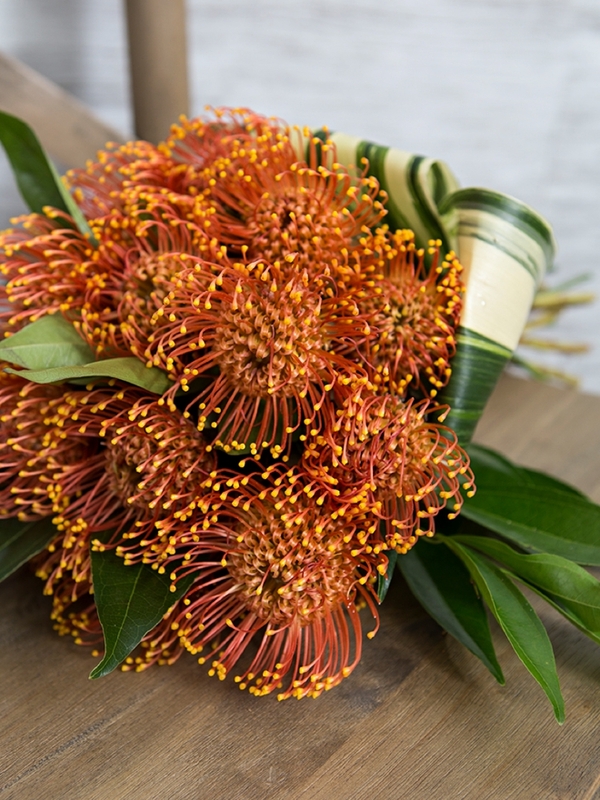 Pin Cushions are very hearty flowers that can look fabulous out of water for hours, which makes them a terrific choice for bouquets and boutonnieres! Each flower has a minimum vase life of 6 days, which is awesome. 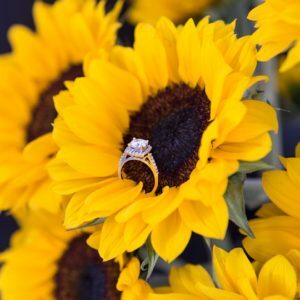 There is only 1 flower per stem and the size will span from 2″ – 3″ wide, with a minimum of a 12″ stem. The stems on these flowers are super thick and so you’ll want to use a heavy duty pruner like these PowerGrip2 Pruning Shears from Fiskars to make clean, proper cuts. 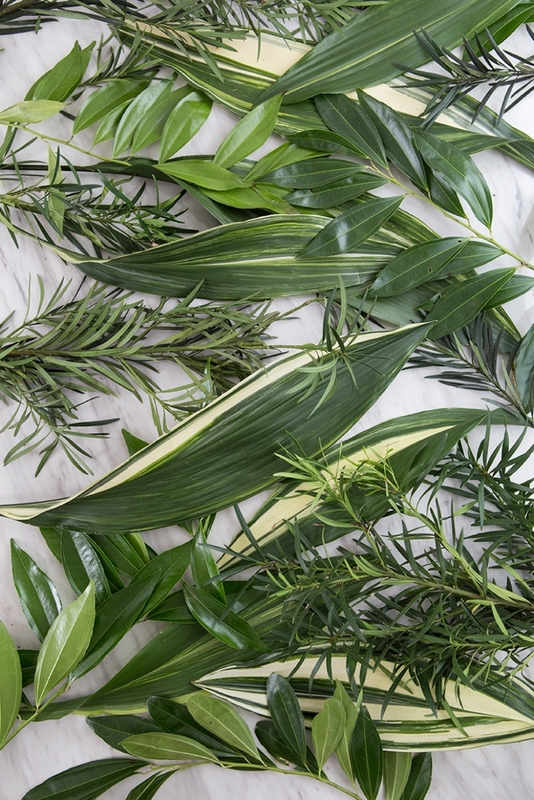 When ready to arrange, give each stem a fresh diagonal cut. 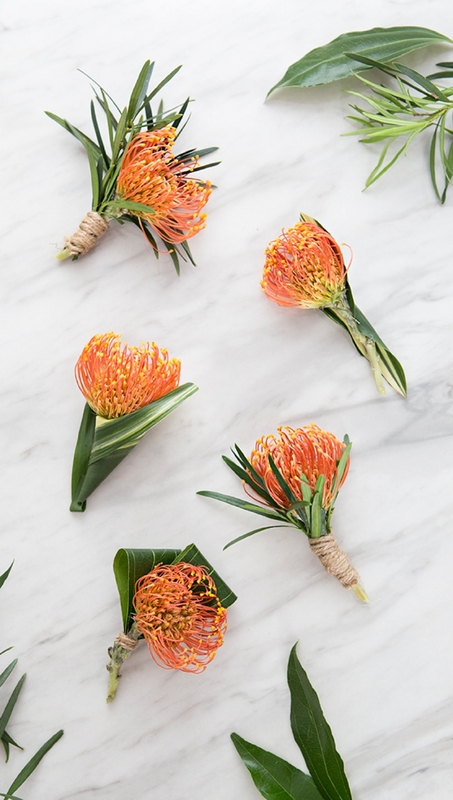 One single pin cushion paired with a leaf or two would make fabulous boutonnieres! They are so unique and interesting looking I just want to touch them, but unlike their namesake – they aren’t sharp at all!